For months now, virtually all global risk assets have kept climbing or holding near multi-year highs on nothing more than hopes that additional central bank stimulus that would send waves of cash seeking a home and power asset prices higher, regardless of building evidence of slowing global growth and an intractable EU solvency crisis that remains a fatal threat to global markets. Indeed, the unprecedented influence of central bank interference, and thus its unpredictable effects, was the chief concern of top analysts this week at The Big Picture conference hosted by Barry Ritholtz, one of the premier finance bloggers. See here for details. Overall, global equity and currency markets remain in their tight trading ranges of the past month. However this past week markets retreated towards the bottom of those monthly trading ranges. The big new thing was the start of Q3 earnings. Their weakness was anticipated, but apparently not as priced in as thought. Sure, there were also all kinds of reports confirming the already established slowing or stagnant global growth picture, but that’s old news. Besides, the prevailing view has been that new, often unlimited central banks stimulus programs were enough by themselves to keep assets rising despite economic realities. So here’s the biggest question coming out of this past week. Will Q3 earning reports prove to be the catalyst for the long anticipated pullback? Will they be the reality check that awakens markets from their stimulus induced highs and pulls them down back into the cold reality of slowing growth bringing declining earnings and asset prices, regardless of historically unprecedented degrees of central bank money printing and low to negative interest rates? Note that 75% of firms offering forward guidance have cut their earnings forecasts. Results thus far have done nothing to raise earnings expectations. In addition to the steady stream of downbeat data in recent weeks, growth fears were fanned by news that the World Bank had cut growth forecasts for China and East Asia on Monday, which was then followed by the IMF lowering its global growth forecasts Tuesday. On Thursday markets rallied overall on the US jobless claims beat, and S&P’s Spain credit downgrade (to BBB, one level about junk status. That was seen as bullish because it raised hopes Spain would request and receive a bailout. On Friday, however, markets again retreated on growth and earnings concerns. Bulls have argued that the weak earnings season and future guidance was already priced in. The past week’s results suggest otherwise, but earnings season has only just begun. This week earnings season kicks into high gear with far more big name firms reporting. Stock markets tend determine overall market risk appetite. Uncertainties regarding the EU, China, and the US (along with assorted geopolitical tensions) have been with us for a while. There was nothing new last week other than the start of earnings season. The coming week is the first ‘big’ week for earnings season, with hundreds of firms reporting and a huge chunk of the big names and sector leaders that tend to get attention and move markets. For example, Dow components GE, MSFT, and IBM, key financial stocks like Bank of America (BAC.N), Citigroup (C.N), Goldman Sachs (GS.N), Morgan Stanley (MS.N. ), and other blue chips like tech giants INTC.O, GOOG.O, and also MacDonald’s Corp (MCD.N), UnitedHealth Group (UNH.N) and Johnson & Johnson (JNJ.N). –Refute the bull’s argument that markets had already priced in a weak earnings season. –Reinforce the bear’s argument that slowing growth indeed must soon hit earnings and risk asset prices. Then the long anticipated pullback, despite central bank easing, is far more likely. For more on what’s likely to move markets this week, see our post on coming week market movers. The tight trading ranges at relatively elevated levels have not provided low risk entry points, not for multi-week trades nor for long term investments. We sit tight for now given the lack of direction. Overall thin trading volumes suggest most players agree with this approach. What is clear is that the leading central banks remain committed to printing money and allowing their currencies to drift lower, so for the longer term, everyone whose central bank is in long term easing mode (most of the major central banks are) needs to start increasing their exposure to more responsibly managed currencies or assets linked to them. Not sure how to do that? I’ve got a new book out full of solutions. I’ve got a new book out that’s full of solutions. It’s the only forex book I know of that’s written for those seeking safer, simpler ways to do that than generally found in forex or international investing guides. 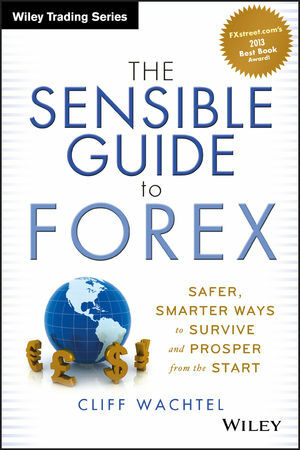 So take a look at The Sensible Guide To Forex: Safer, Smarter Ways To Survive and Prosper From The Start (Wiley & Sons, 2012).